What’s the Status on Tweetie 2 for Mac? Tweetie for Mac is the best desktop Twitter client I have found. I really like it, and the interface has streamlined the Twitter experience for me. Unfortunately, it’s long due for an update. Twitter, as I’m sure you remember, released their “Project Retweet” feature several months ago. This has caused some problems for me. I now see a small fraction of retweets from people I follow, since most of them use the “official” retweeting method, and I can’t create the newfangled retweets myself, either. It’s frustrating, especially since I can do both using Tweetie 2 for iPhone. Tweetie 2 for Mac was announced back before Twitter threw the switch on the retweet API, and we haven’t heard a word about it since. Supposedly it’s in development, but despite patient waiting, there hasn’t been a beta or even any news about it. Poll: What Do You Think of Twitter’s New Retweet Feature? Twitter rolled out their new native retweet feature recently. Few desktop/iPhone clients have added support for it yet via the API, but many users can already use it through the web interface. What do you think of it? Is it a good idea, or does it need more work? My opinion is that it will make it a lot easier to retweet things, which may in turn increase the number of times things are retweeted. No more trying to edit the tweet to fit “RT @username” in. All you have to do is push a button and move on. I think it will also clean up our timelines, since you’ll only see a particular retweet once, shown as the original author’s tweet, instead of seeing twelve reposts of the same thing. I think the biggest thing missing is the inability to add commentary, which matters in some situations, but isn’t necessarily something you have to do every day. What’s your take? Take a minute to answer the poll below and/or leave a comment. What do you think of the new "offical" retweet feature? Note: If you’re viewing this in an RSS aggregator you might have to click through to see the poll. I didn’t know this until recently, but Tweetmeme has an API for displaying the number of times and URL has been retweeted. A quick request to http://api.tweetmeme.com/url_info?url=[the URL] will return an XML, JSON or PHP response. You can pass the full URL as the argument, or a short URL that goes to the same place. If you want to see a quick example of how you can use the API, have a look at this WP Recipes snippet: Display the number of tweets for each page or post. 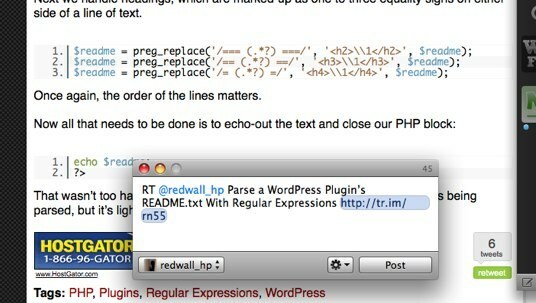 <a href="http://twitter.com/home?status=RT @redwall_hp <?php the_permalink(); ?>"
When clicked, it takes the visitor to Twitter, where it fills-in the update box for you. Just be sure to change “@redwall_hp” to your username. As you may know, my favorite desktop client is Tweetie for Mac. If you use Twitter through a desktop client (whether it’s Tweetie or some other), you probably wish you could click those green retweet buttons and have them open in your client instead of taking you to Twitter.com. Now you can, at least, if you use Tweetie for Mac. I whipped-up a quick Greasemonkey script, known as Tweetie Retweet URL Replacer, that rewrites any Tweetmeme button you come across to load the retweet into Tweetie. 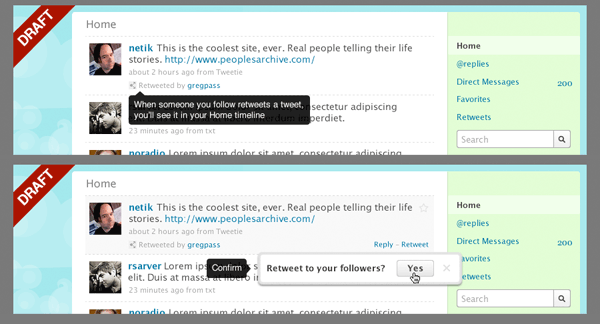 This works on the same principle as the bookmarklet that Atebits supplies on the Tweetie website. At the present, the userscript only works with Tweetmeme buttons, but I may expand it to include other popular widgets in the future. If you follow social media coverage much, you’ve probably heard already through Mashable or TechCrunch: Twitter is rethinking the retweet, and integrating native API calls for retweeting into the service.